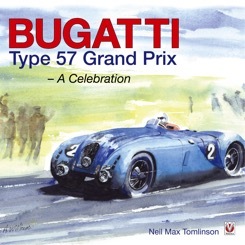 If you are attending the VSCC on Sunday 2nd August, do not miss the opportunity to pop into The Bugatti Trust and meet Max Tomlinson, the author of ‘Bugatti Type 57 Grand Prix’ recently published by Veloce. The RRP is £50 and a limited number will be available to purchase. The work examines the Type 57 Grand Prix cars, reinterprets existing records and reveals new material. A fascinating read for all. Max will be available for book signing between 11.00 a.m. and 4.00 p.m.